It thrills you, provokes you, disheartens you and delights you as well. Directly investing in the equity market is alluring and nerve-wrecking. It thrills you, provokes you, disheartens you and delights you as well. Here, you are always in the thick of things and you are only responsible for your own acts. Anyways, directly investing in stocks offers you excellent opportunity to make money but the behavior of the stock market is also unpredictable and shredded in absolute volatility. Chances are also quite high that you may end up losing. Many of you invest in the equity market, but not all of you become a Warren Buffet or a Bill Gross. So, if you are not very much strong emotionally, if you do not have that acumen and ingenuity but still interested to build up wealth, nothing is better than investing in the mutual funds. Here are the reasons why you should opt for investing in the mutual funds. The novelty of mutual funds lies in the fact that these are professionally managed. The professionally experienced fund managers are responsible to manage your money in such a way so as to maximize the return for you. So, while investing in the mutual funds, you do not have bother in which directions the stocks are heading to. Moreover, you do not have the time to track the market. All these make investing in the mutual fund a good business sense. Another excellent feature imbibed in the mutual funds is that it offers the advantage of diversification. Many of the funds are designed by scientifically mixing different securities. Even sector specific funds, thematic funds, growth funds, balanced funds and overseas funds are also available. You can invest in fund/s depending upon financial situation as well as risk-return trade off. You can enter in the fund industry with a very low capital base. It can be as little as $100. This helps you build up your capital at a gradual pace. Moreover, you do not have to bear the pressure of directly investing in the equity market. A wide variety of mutual funds are on offer by the different asset management companies. Some mutual funds are smart mixture of government securities and equities so as to reduce the risk factor. These funds aim at capital protection of the investors. Index funds and exchange-traded funds are also there which try to replicate the performance of the broader market. Then there are growth-oriented funds and balanced funds. You can invest in the fund/s according to your choice. A recent addition to the mutual fund industry has been the systematic investment plans (SIPs). 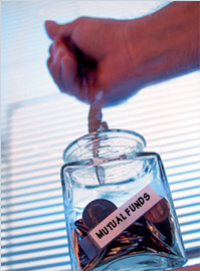 SIPs offer you the chance t invest in a mutual fund on a regular basis. SIPs offered by some fund houses, allow the investors to invest as little as $50 every month. This helps you build up a healthy corpus after a certain period of time. If you want to build up your wealth but do not want to take the risk of investing directly in the equity market by yourself, you can opt for investing in the mutual funds.